Morningside Hospital | In territorial days, Alaskans could be one of three places… Inside (in Alaska), Outside (anywhere else), or Morningside (Morningside Hospital). “FamilySearch, historically known as the Genealogical Society of Utah, which was founded in 1894, is dedicated to preserving the records of the family of mankind. Our purpose is simple—help people connect with their ancestors through easy access to historical records." The Morningside records are not yet available, but should be soon. If you’d like to check out the FamilySearch.org website, it’s here. 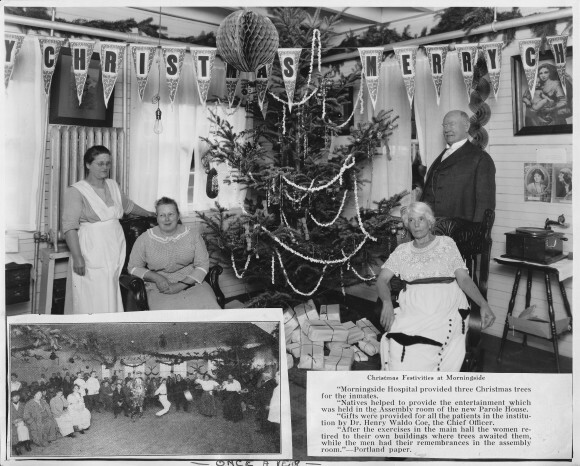 The text on the photo reads: Christmas Festivities at Morningside Morningside Hospital provided three Christmas trees for the inmates. 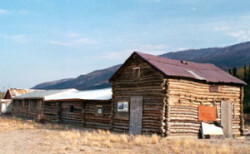 Natives helped to provide the entertainment which was held in the Assembly room in the new Parole House. Gifts were provided for all the patients in the institution by Dr. Henry Waldo Coe, the Chief Officer. After the exercises in the main hall the women retired to their own buildings where trees awaited them, while the men had their remembrances in the assembly room. 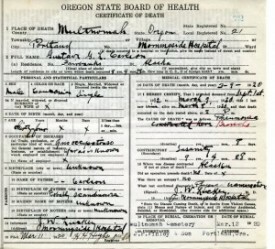 My last post was about citizens being hired by the U.S. Marshall to take patients from Alaska to Oregon. The article below details one of the more exciting trips. Patient Jennie Zimmerman was 49 and from Fairbanks. She was admitted to Morningside Hospital on March 2, 1919. Her diagnosis on admission was, "Paretic, noisy and destructive. P.c. poor." She remained at Morningside for more than 20 years, dying on January 18, 1941. Her two daughters, who were living in Portland, were notified. 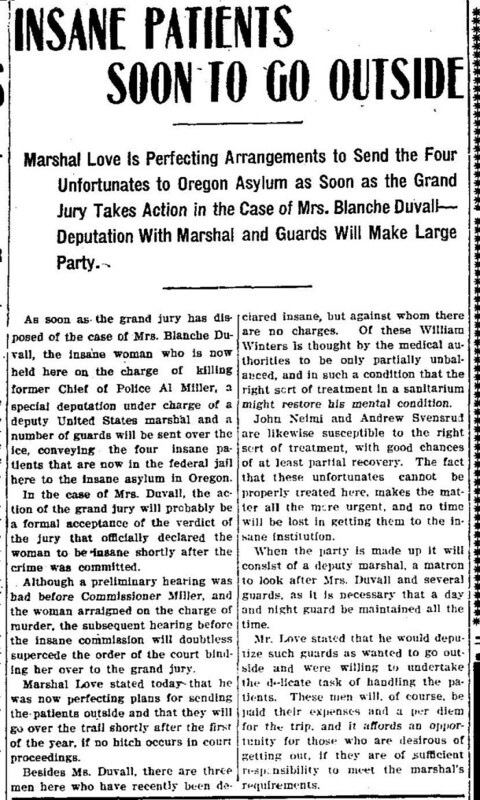 From the Morning Oregonian: The sole custodian of an insane woman, whom she was taking from Fairbanks, Alaska to Morningside asylum, in this city, Miss Lillian D. Hill of Fairbanks recently arrived here safely with her charge, after a terrible experience on the way, when the woman, Mrs. F. C. Zimmerman, escaped from her and made her way at midnight to an Alaskan glacier. Miss Hill, her task completed, is now on her way back to Fairbanks. Miss Hill was engaged as a “matron” by the United States Marshall in Fairbanks despite her slight build and the 160 pounds of the patient. The trip of 400 miles over the trail from Fairbanks is trying for a man acclimated to the country, but for a woman in charge of an insane person, the trip proved to be a thriller, according to Miss Hill. It was at the Rapids Roadhouse, half way between Tanana valley, of which Fairbanks is the center, and the coast, that the patient decided to wander out into the night. Her absence was discovered shortly afterwards by Miss Hill who followed her tracks in the snow. Neither of the women were clothed other than their night garments. Miss Hill, running from the roadhouse in terror that Mrs. Zimmerman would become lost, did not stop to don so much as a cloak. She found Mrs. Zimmerman after a search lasting three-quarters of an hour on the glacier. “I didn’t dare leave the women,” said Miss Hill, “for if I went back for assistance I was afraid she might perish. For a few minutes I didn’t know what to do. If we stood still we would freeze to death and if we stayed out we might die of exposure. There was no telling how long whim would keep my patient from refusing to return. “Finally, I succeeded in inducing her to walk back and forth on the glacier for three-quarters of an hour, until she became exhausted and was willing to return to the roadhouse.” The remainder of the trip was made without incident. I got an interesting email yesterday from John Drews, who relayed a part of the Morningside story I’d never heard before. “Many years ago I interviewed a gentleman in Fairbanks who had worked as a Deputy Marshall in Alaska during the territorial days. He told me about criminals and "others" that would be held in the jail until court hearings could be held. This could take up to a year at times because of the traveling justice. When they had folks that were to be transported out of Alaska, they would advertise that any honest civilian wanting to go to Seattle could hire on as a temporary deputy to assist on the trip. They would transport criminals and the "insane" together and many times had to keep them all in restraints. He told of one man who had to be strapped to a cot for the entire trip because of his insanity and violence. 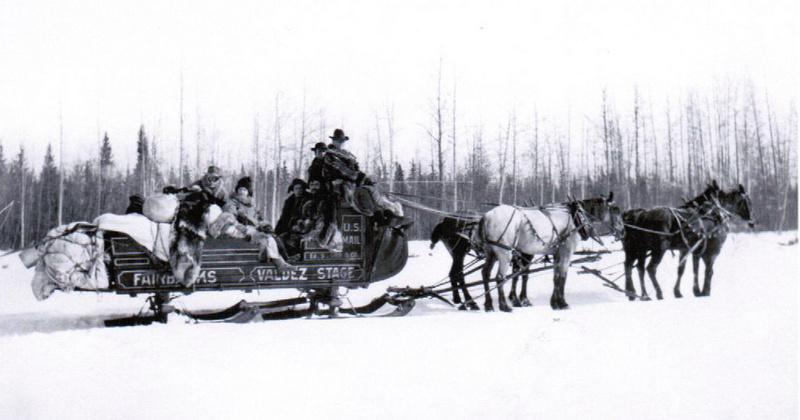 The trips were made from Fairbanks by stage or later by train and then onto a steamer bound for Seattle. He never mentioned Morningside by name but it is pretty clear now. The fellow I interviewed was a Deputy Marshall there in the 30's & early 40's, he later joined the Fairbanks Police Department. I was employed at FPD from 1975-95 and was interested in the early history of the department and did the interview for that reason.” After doing a little research on newspaperarchives.com, it was apparent that this practice started very early on. The following article is from December 17, 1908 edition of the Fairbanks Daily News. When the Lost Alaskans blog went online five years ago, we began to hear from people who were searching for friends and relatives who were committed to Morningside Hospital, some as long as one hundred years ago. We hope the Morningside Hospital Patient Database will make their search easier and answer their questions. There are three types of records available. The Quarterly Reports have diagnoses and other information on patients, the Death Certificates are those who died while at Morningside, and the court records document the commitment process. There are gaps in all of the record sets so the search continues. The database will be formally announced in January. In the meantime, give it a try and send comments and recommendations. Click on Search Patient Records and then enter at least three consecutive letters of the patient’s last name and, optionally, any part of the patient’s first name. The database searches both the name as entered as well as alternate spellings found in the records. We owe a huge debt of gratitude to the Alaska Mental Health Trust Authority for their long-term support, especially over the past six months. The Trust made it possible for our volunteer researchers to get to record archives in Maryland, Alaska and Oregon. The entry of 45,000 records would not have been possible without Trust support. And thanks to the volunteers who collected the information in the database. Volunteers by type of record are Meg Greene and Niesje Steinkruger (Court Records), Eric Cordingley, David Anderson and Sally Mead (Death Certificates) and Marylou Elton, Karen Perdue, Ellen Ganley and Robin Renfro (Quarterly Reports), and Deborah Smith (Alaska State Archives). Many thanks to Doug Toelle, our project manager at Access Alaska And last, but not least, thanks to database programmer Don Kiely, web designer Jana Peirce, and data entry queen Nancy Lowe, all of whom are hugely talented and extremely patient. Niesje Steinkruger sent this picture of the Valdez Stage. Her description is below. Keep in mind that the trail between Fairbanks and Valdez was 400 miles long. "This is a good picture of the Valdez Stage. Many patients travelled from Fairbanks and the Interior to Valdez via this Stage. It was a long, hard trip by Stage, Boat and Train to Morningside Hospital in Portland. The patient was accompanied by a US Marshall. Sometimes the patient was transported with convicted criminals the Marshall was taking south." 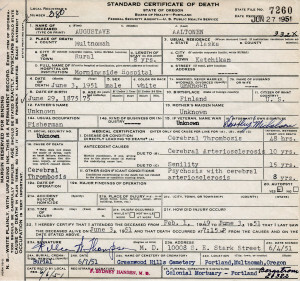 Nearly 300 more death certificates are now available in the Morningside Hospital Research Archive. Once again, we have Eric Cordingley and David Anderson of Portland to thank for these invaluable records. I'm sure they're on a first name basis with everyone who works at the State of Oregon Archives. Thanks to Eric and David's dedication and persistence, there are now approximately 500 death certificates posted in the Research Archive.